Chris Gaines is a Vanderbilt football legend who played for the Miami Dolphins in 1988. Coincidentally, he played on the same team as my old friend Tony Furjanic. The last info I have on Gaines is that he was executive president of Medicrea USA. He is still recognized all these years later. Jocephus Brody is a wrestling legend (if I don't say that, he will kill me). He is also one of the top stars at Resistance Pro. A while back, I predicted Jocephus would hold R Pro gold by the end of 2013. The year is quickly moving along and Jocephus has yet to win any title, but he will soon. I might have to update my prediction to 2014. It will happen though (and I am not just saying that so Jocephus won't kil me...I truly believe it). Jocephus is a bear of a man. He is an excellent wrestler with a lot of personality and charisma. He always gives us an interesting interview (when he isn't focused on hurting me). He also wrestles in the Nashville area and elsewhere. No matter where it is, I strongly encourage you to see him in action. I guarantee that you will be entertained. Jocephus met Gaines just recently. I assume they had a conversation about hurting people. 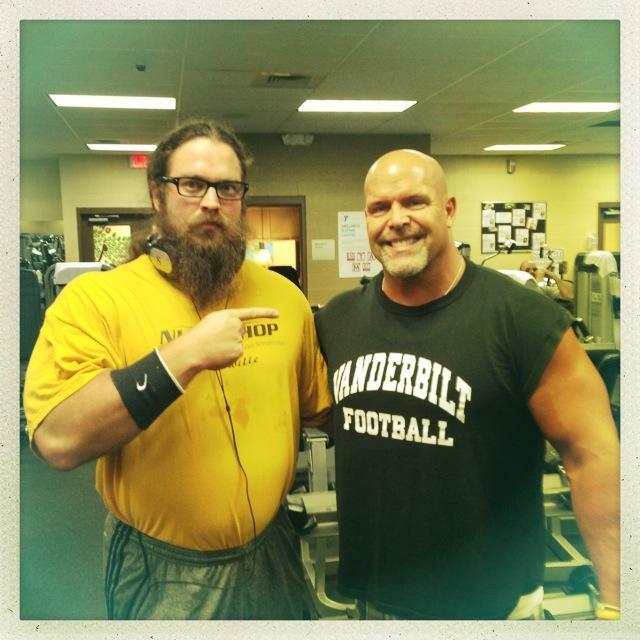 Maybe Jocephus even tried talking Gaines into being his tag team partner. Look at those guys! They would be an impressive tag team. Heck, Jocephus alone would be an impressive tag team. Jocephus Brody and Chris Gaines in Nashville, TN-August 2013.